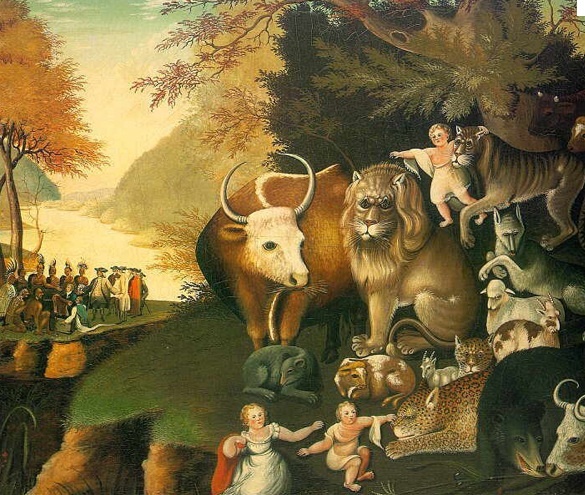 Edward Hicks (1780-1849), the Quaker painter, painted about 100 versions of the peaceable kingdom, based on the 11th chapter of Isaiah, read on Tuesday of our 1st week of Advent. A harmless looking selection of scripture, yet reading on you find that Paul is writing to a troubled church at Corinth, a seaport city filled with upwardly mobile people who want to get ahead in the world. There are factions in the church; people fighting for power and prestige. Some don’t believe in the resurrection of Jesus and their own resurrection. Yet, Paul still loves them like a father. We are in charge of a house, but it’s not ours. God has a claim on our life, so don’t fall asleep where you live, in your own house, your own family, your own work, your own situation or condition of life. Don’t fall asleep even if everything looks like it’s falling apart. That’s where God comes to all of us–where we are now. That’s when God comes, when things look like they’re falling apart. What kind of world is God coming to now? How are things in your house? This entry was posted in Passionists, Religion and tagged Advent, Advent readings, First Sunday of Advent, Isaiah, Jesus Christ on November 26, 2011 by vhoagland. In the four weeks of Advent the Prophet Isaiah, John the Baptist and Mary of Nazareth are messengers from God. Isaiah, the first voice we hear, brings a message of hope. Isaiah was a priest in the temple of Jerusalem in the eighth century, the worst of times, when the powerful armies of Assyria were ravaging the kingdoms of Israel and Judah. God came to him in a vision in the temple’s Holy of Holies (Isaiah 6) and Isaiah was overwhelmed by a Presence more powerful than mighty armies and their clever leaders. God is “Emmanuel,” “God with us.” no matter how bad the times. This was Isaiah’s message then, and it’s his message for us today. Isaiah’s prophecies pervade Advent time. They may seem unreal to us, as they must have seemed unreal to those who saw Assyrian armies wasting their land. All nations streaming toward the mountain of the Lord’s house, laying down arms of war? All peoples, nations and races living in harmony and peace? Today, the prophet’s promise may still seem an impossible dream in our splintered world, But Advent revives our hope, not just a personal hope for ourselves and those dear to us, but hope for the whole world. The peaceable kingdom, seemingly impossible, is not impossible for God. God is with us. Emmanuel. This entry was posted in Passionists, Religion on November 26, 2011 by vhoagland. Today I wrote a reflection for our province website entitled “Hanukkah and Christmas.” The Jewish and Christian celebrations coincide closely this year. Hanukkah celebrates the rededication of the temple in Jerusalem after its desecration by Antiochus Epiphanes IV in 167 BC. Christmas celebrates the birth of Jesus Christ approximately 167 years later. Both of these feasts are about the Presence of God. For the Jews God was present in the temple in a special way. For Christians God is present in Jesus Christ, who spoke of himself as the temple of God in this world. His presence remains and cannot be destroyed. Many days, I look out my window at a great church across the street here in Union City that my community had to let go of some years ago. As with many holy places nowadays, we couldn’t keep it going financially. It seems to me the ancient mysteries of Hanukkah and Christmas constantly repeat themselves over time. Buildings, places, however sacred, rise and fall. Jesus Christ does not rise and fall. The Christmas mystery reminds us of his abiding Presence. He is God with us, Emmanuel, and he always gives us life. Still, we mourn when buildings go. This entry was posted in Passionists, Religion and tagged Christmas, Hanukkah, Jesus Christ, Temple, Union City on November 18, 2011 by vhoagland. Today’s scripture reading at Mass from the Book of Maccabees tells of the bravery of Eleazer, an old scribe put to death during the invasion of Jerusalem by Antiochus Epiphanes IV in the Second Century BC. All Eleazer had to do was eat some pork to signify he wasn’t “addicted” to his Jewish belief and he was home free. But he wouldn’t do it and so they put him to death. The Eleazers are still with us. One of the reasons the church will survive is the example of its elderly. I was with some of them last night. This entry was posted in Passionists, Religion and tagged Church survival, elderly, Maccabees, persecution on November 15, 2011 by vhoagland. Here’s the story for little ones, and maybe big people too. This entry was posted in Passionists, Religion and tagged Christmas, little children, Santa Claus, St. Nicholas on November 14, 2011 by vhoagland. Santa’s making his way into Macy’s and Walmart and thousands of stores and countless television advertisements these days. I’d like to save him and get him back to what he does best. The best way to get Santa Claus back to what he does best is to know his story and tell it to others. I’m going to put up soon a little clip that may help little children get to know him. Nicholas lived way back in the 4th century in the busy seaport of Myra along the Turkish coast. He’s honored today in the great church of St. Nicholas in the city of Bari along the Adriatic Coast in Italy. Let me tell you his story. Nicholas likely belonged to one of Myra’s wealthy families who made a living on the sea. But he wasn’t spoiled growing up. His family taught him to be generous with others, because that makes you richer than anything else. One day, Nicholas heard there a man in Myra who lost all his money when his business failed. He had three beautiful daughters who were going to get married, but there was no money for their marriage and no one wanted to marry them because they were so poor. They didn’t even have enough to eat, and so the father in desperation decided to sell one his daughters into slavery, so that the rest could survive. The night before she was to be sold, Nicholas came to the window of their house and tossed in a small bag of gold and then vanished in the night. The next morning, the father found the gold on the floor. He had no idea where it came from. He thought it was counterfeit, but it was real. He fell to his knees and thanked God for this gift. Then he arranged for his first daughter’s wedding; there was enough left for them to live for almost a year. But he kept wondering: who gave them the gold? Before the year ended, the family again had nothing and the father, again desperate, decided his second daughter had be sold. But Nicholas heard about it and came to the window at night and tossed in another bag of gold. Again, the father couldn’t believe it. Who gave this gift? A year passed and their money ran out once more. One night the father heard steps outside his house and suddenly a bag of gold fell onto the floor. The man ran out and caught the stranger. It was Nicholas. “Why did you give us the gold?” the father asked. When the bishop of Myra died, the people of the city along with the neighboring bishops came together in their cathedral to select a new bishop. They prayed and asked God to point out who would it be. In a dream, God said to one of them that the next morning someone would come through the cathedral door as they prayed. He’s the one. It was Nicholas who came through the door, and they named him their bishop. This unassuming man, so good, was meant by God to lead them. 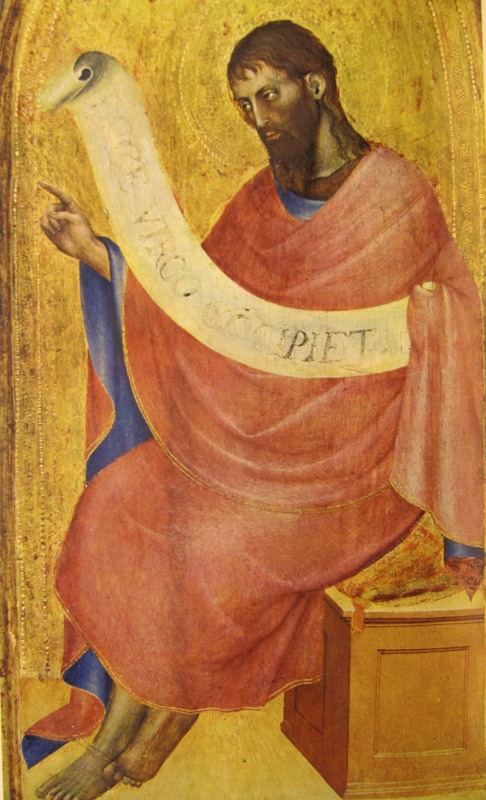 As bishop of Myra, Nicholas was always ready to help people. He helped anyone in need and then quietly he’d disappear, without waiting for thanks. He was a holy man, and word about him spread quickly. He always wanted families to have enough to eat and a good place to live, that children got ahead in life, and that old people lived out their lives with dignity and respect. And he always loved the sailors on the sea. Without their ships, people wouldn’t have food and the things they need. Nicholas is known today as Santa Claus. I like him better as St. Nicholas. He’s an example of a “quiet giver,” the kind of person who gives and wants only God to know about it. That’s giving of the purest kind. This entry was posted in Passionists, Religion and tagged Christmas sales, Macy's, Saint Nicholas, saints, Santa Claus, St. Ncholas, Walmart on November 14, 2011 by vhoagland. I’m getting ready for a session on Advent and Christmas next Monday evening at St. Mary’s Parish in Colts Neck, NJ and I prepared two short video for children. One about Jesus, the other about St. Nicholas. We have to reclaim Christmas. Might as well begin with the little children. This entry was posted in Passionists, Religion and tagged Advent, children, Christmas, Jesus, Santa Claus, St. Nicholas on November 10, 2011 by vhoagland.